* Donation of $10 per flat included. Maurice Clarett played a key role in Ohio State’s drive to the 2002 National Championship as a true freshman. He’d earn All-Big 10 Honors and be named Freshman of the Year, running for 1237 yards and 16 touchdowns on 222 carries. His game winning touchdown in double overtime in the Fiesta Bowl over the Miami Hurricanes put Clarett on the map nationally, but little did anybody know the difficult road he’d travel from that point further. Soon thereafter it was revealed that Clarett had been receiving improper benefits (- more than he later earned at 10 games in the UFL,) leading to his suspension for lying to NCAA investigators and his eventual departure from Ohio State. Maurice decided to declare for the NFL draft. The problem was, the NFL had an agreement in place with the NCAA not to allow high school students who had not been out of school for less than 3 years into the league. Clarett won in court in 2004, and declared for the 2005 draft. Maurice did not fare well at the combine, and was very humbled by the experience. His former Alma Mater refused to allow him to attend their pro day. 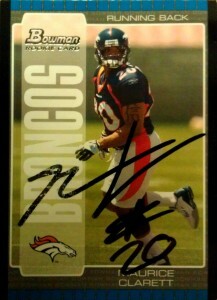 The Broncos though liked what they saw out of Maurice though. He seemed to be a good fit for their ZBS based on his skillset, and ability to burst through the hole, staying low to the ground, and adjusting his speed and his direction well. They took him surprisingly in the 3rd round of the 2005 draft. Unfortunately Clarett was not prepared for the rigors of the league and found himself cut, before even playing a down. With his football glory completely stripped of him, and financial troubles setting in, compounded by his legal battle with the league, life was in a downward spiral for the one time shooting star. Clarett hoped to jump start his career again by playing in the NFLE or an Arena affiliate, but instead was arrested after a robbery and high speed chase in 2006. With his 4 month daughter present at the court room, Maurice took a plea deal, and had 3 years to think about his life behind bars. Maurice began blogging. That’s when I began to catch up with Maurice. Reading his blog, it was obvious that he was ready and chomping at the bit to turn his life around. In 2010 he earned an early release. 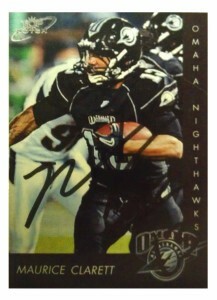 The UFL thought that Clarett was a great fit for the league, and he was signed by the Omaha Nighthawks a few days later. The Nighthawks were loaded with former NFL veterans on offense. Jeff Garcia led the way at QB, along with Ahman Green at RB, and Jeb Putzier at TE. Clarett was to be Green’s understudy and heir apparent to the former Packers star. He’d score his first professional touchdown in a Week 7 contest against Las Vegas. He’d not return to the league as financial pressures began to mount, until the UFL’s quiet demise in 2012. Maurice has spent a lot of time doing speaking engagements, encouraging other future stars not to lose sight of their goals. He’s also become an outspoken celebrity on depression. In 2012, he was invited back home to Ohio State to a reunion of the 2002 National Championship team, wrote an autobiography tell all, and recently was in an ESPN 30 for 30 interview. I had made this custom of Maurice some time ago, and always wanted to get it signed. Thanks to Deadhorse from the Sportscollectors.net message board, I was able to locate a possible address for him, and shot these two cards out with a donation to his foundation. I had thought that these were long gone, even though 60 days for me is not much to sweat about, so to have these show up on my 4th successful day in a row was a real charge.